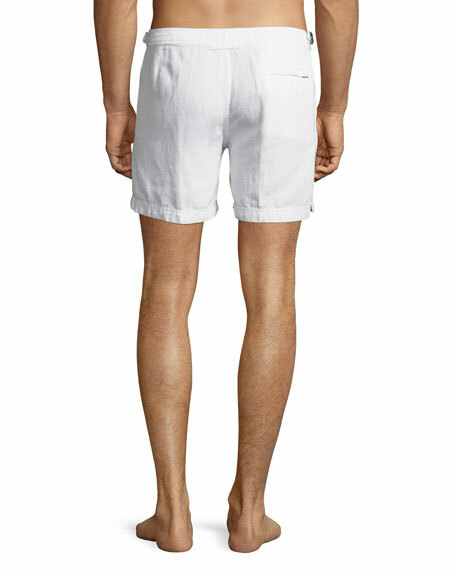 Orlebar Brown "Cavrin" solid shorts. Side slash pockets; back zip pocket. Adjustable buckled tabs at hips. Hem hits slightly above knee. 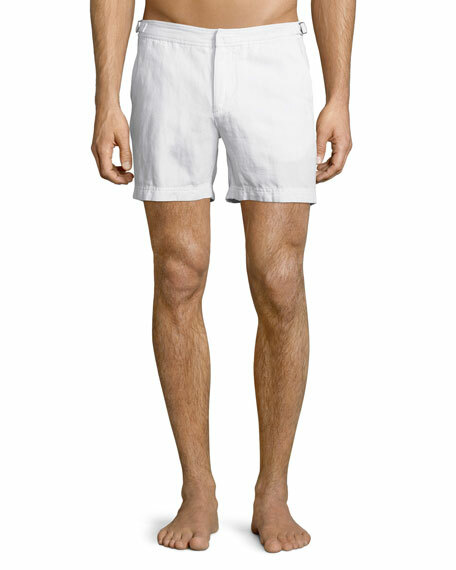 Orlebar Brown launched in 2007 as the more tailored approach to beach and swim shorts. Not just a swim short but the 'short you can swim in', OB is something you wear on the beach, by the pool but is also smart enough to go have lunch or drinks with friends. The range has now evolved into a full ready to wear resort collection including Riviera shorts and chinos, sharply tailored sweats and jackets as well as bags and other accessories. Inspired by a 1960s pool side utopia, the Orlebar Brown world draws inspiration from Slim Aarons' iconic pictures of Riviera and Palm Beach life during that decade. Not just a smarter look on the beach, but a reminder of the sophistication that once went with travel and holidays. Intrinsically British but ultimately international. For in-store inquiries, use sku #1676101.